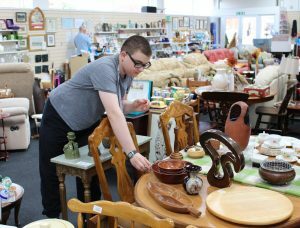 Weldmar has a well-established retail operation of twenty charity shops and six outlets across Dorset – none of which would be able to operate without the support of a team of volunteers. Caroline Munslow, Weldmar’s Volunteer Services Adviser, said “Being a volunteer in one of our shops is both fun and valuable, and an enormous contribution in raising funds for the care we provide throughout Dorset. At the moment, we are urgently looking for more volunteers at all our charity shops and outlets – we need you, can you help us?”. If you have a flair and passion for retail, why not join Weldmar Hospicecare as a Retail Volunteer. Giving just a few hours of your time can make a real difference. Pam Bird, who volunteers at Weldmar’s Dorchester shop on Trinity Street, explains “I would come in to the shop to buy things and one day thought I would love to volunteer here. So I met the manager and I started the following Monday and have been here ever since. I get a lot of pleasure out of it and feel I am doing something for somebody else. The shop is very important because it makes everybody aware of Weldmar Hospicecare”. Ben Crosskey is 18, and is a volunteer at Weldmar’s Outlet in Poole’s Nuffield Industrial Estate. Ben said “I love volunteering at Weldmar’s Poole Outlet. I have been helping here now for over a year, after seeing, in the Daily Echo, that it had opened and were in need of volunteers. I now help five days a week, as I love the fun atmosphere and the really friendly staff that I work alongside. I really enjoy doing so many different tasks – steaming donated clothes, creating displays on the shelves, and going out in the van to collect and deliver the furniture we sell. I like to think that everything I do is helping a Weldmar patient or their family somewhere in Dorset; that what I do impacts their lives and makes it a little better for them”.